Ateles hybridus er ein edderkoppape som lever i Colombia og Venezuela. Nokre individ av arten med blå augo (regnbogehinner) er observerte. ↑ Aldana, Ana María; Beltrán, Marta; Torres-Neira, Johanna; Stevenson, Pablo R. (2008). 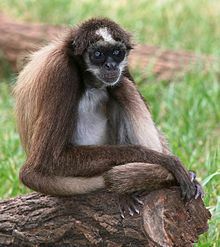 «Habitat Characterization and Population Density of Brown Spider Monkeys (Ateles hybridus) in Magdalena Valley, Colombia». Neotropical Primates 15 (2): 46. doi:10.1896/044.015.0203. ↑ Meyer, Wynn K.; Zhang, Sidi; Hayakawa, Sachiko; Imai, Hiroo; Przeworski, Molly (2. mai 2013). «The convergent evolution of blue iris pigmentation in primates took distinct molecular paths». American Journal of Physical Anthropology 151 (3): 398. PMID 23640739. doi:10.1002/ajpa.22280. Denne sida vart sist endra den 17. februar 2017 kl. 13:46.